Light Messages Publishing, 9781611531114, 338pp. From the shores of The Great Lakes to the slums of Bombay and a tiny island in between, this love story takes the reader on an intimate journey to unravel a family secret that’s lain hidden for generations. To satisfy her wandering feet, eighteen-year-old Gillian McAllister is sent from Ireland to Canada in the summer of 1932. She arrives with her Irish ways intact, determined not to let the wiles of crop duster Christian Hunter woo her into submission. Yet as the summer unfolds and the sweet taste of love grows, Gillian’s appeal lures more than she anticipates, shattering the life they’ve built. Fourteen years, a Great Depression, and a World War later, Christian sets out to discover why Gillian was ripped from his life. What he discovers on the Isle of Man will change them both forever. Not even a thatched cottage by the sea, a spritely Gillian, or memories sprinkled on a page can mask the secret that has been buried for too long. But it isn’t until a set of poems is given to Gillian’s granddaughter that the real mystery—Gillian’s true secret—is freed. Benjamin Franklin Silver Medal Award winner. Susan Örnbratt was born in London, Canada and grew up on the dance floor until her brother’s high school rowing crew needed a coxswain. Quickly, she traded in her ballet shoes for a megaphone and went on to compete in the Junior and Senior World Championships and the XIII Commonwealth Games in Edinburgh, Scotland. A graduate from the University of Western Ontario in French and the University of Manitoba in elementary education, as well as attending L’Université Blaise Pascal Clermont-Ferrand II in France while she worked as a fille au pair, Susan has gone on to teach and live in six countries. Although a maple leaf will forever be stitched on her heart, she has called Sweden her home for the past sixteen years with a recent three-year stint in North Carolina, USA for her husband’s work. 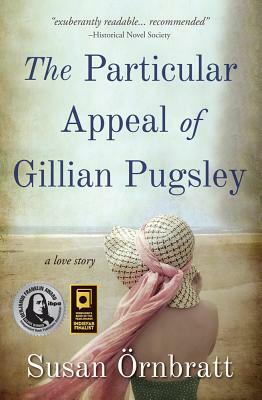 It was there where Susan wrote The Particular Appeal of Gillian Pugsley. Susan lives in Gothenburg with her husband and two children and an apple tree beloved by the local moose population. If she isn’t shooing away the beasts, you can find her in her garden with some pruning shears, a good book and always a cup of tea. If Susan were dried out, she could be brewed.